Recombinant fragment, corresponding to amino acids 60-383 of Human KAP1. Gamma irradiated HeLa cell lysate (WB), and cells (ICC). This antibody gave a positive result in IHC in the following FFPE tissue: Human spleen. Our Abpromise guarantee covers the use of ab22553 in the following tested applications. WB Use a concentration of 1 µg/ml. Detects a band of approximately 100 kDa (predicted molecular weight: 88.5 kDa). Immunocytochemistry/ Immunofluorescence - Anti-KAP1 antibody [20C1] - ChIP Grade (ab22553)Image from Chen L et al., J Biol Chem. 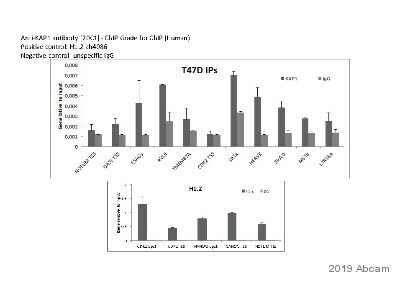 2012 Nov 23;287(48):40106-18. doi: 10.1074/jbc.M112.380865. Epub 2012 Oct 11. Fig 3.; November 23, 2012 The Journal of Biological Chemistry, 287, 40106-40118. Immunofluorescence analysis of A549 cells, staining KAP1 (green) with ab22553. Cells were fixed in 4% paraformaldehyde followed by permeabilization in 0.1% Triton X-100/PBS. Cells were incubated in primary antibody and a FITC-conjugated goat anti-mouse secondary antibody was used to detect staining. Nuclei were stained with DAPI (blue). IHC image of KAP1 staining in Human normal spleen formalin fixed paraffin embedded tissue section, performed on a Leica BondTM system using the standard protocol F. The section was pre-treated using heat mediated antigen retrieval with sodium citrate buffer (pH6, epitope retrieval solution 1) for 20 mins. The section was then incubated with ab22553, 5µg/ml, for 15 mins at room temperature and detected using an HRP conjugated compact polymer system. DAB was used as the chromogen. The section was then counterstained with haematoxylin and mounted with DPX. Publishing research using ab22553? Please let us know so that we can cite the reference in this datasheet. Inquiry: Hi, I want to IP KAP1 using this antibody and then subject the immunocomplex to second round of IP with another antibody. Is the epitope of KAP1-22553 antibody known? If yes, I can synthesis the peptide to elute the KAP1 immunocomplex before I do the second round of IP. Unfortunately, the epitope for this ab22553Anti-KAP1[20C1] monoclonal antibody has not been specifically mapped. The immunogen used is a recombinant fragment, corresponding to amino acids 60-383 of Human KAP1. This was from isoform 1 of the protein (see http://www.uniprot.org/uniprot/Q13263). Once again I would like to say thank you for understanding our Client&apos;s problem. We have been just informed about her decision and she prefers product: ab10483 to try. Please let us known when the product is dispatched. Thank you for confirmation of that. I have now arranged for the ab10483 to be sent to you. This is on the order number xxxxx (Purchase order number "xxxxx"). I would like to suggest to the customer that with this new antibody, optimisation of the conditions used to perform the Western blotting may be required. Using 5% milk in the diluent buffers may be too high so I would suggest reducing to 1% initially to see what the results yield. If your customer would like help in this optimisation please do not hesitate to ask. I look forward to hearing how they get on with this antibody. I would like to return to our Client’s complaint regarding antibody ab22553. In enclosure you can see filled protocol with detailing informations you asked for. I also attach the illustration of when antibody worked at a dilution of 1/1000 with only 6 ug of protein. Here is the description of illustration: wt: the cells showing KAP expression, GP: the cells showing KAP and KAP1 expression, and KAP2 - the cells with calmed down KAP gene. The antibody once diluted in milk, was frozen and used triple. The result you can see showing situation after triple use of this same antibody prepared in milk (5% solution). Thank you for taking time to complete our questionnaire and providing us with the details of the problems you have encountered with the ab22553. 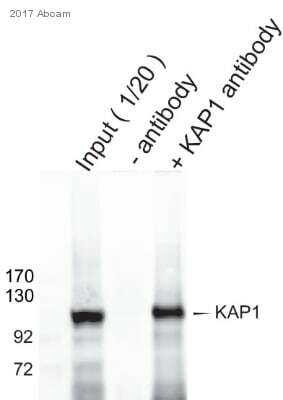 As the customer has mentioned, I am able to provide the anti-KAP1 antibody ab10484 or ab10483 for the customer to try. Please do let me know which would be preferable and I will arrange this. Alternatively, I can arrange for a credit note to be issued. Thank you for your cooperation. I look forward to hearing from you with details of how you would like to proceed. Thank you for your e-mail concerning the anti-KAP1 antibody, ab22553 which our Client had problem with. Unfortunately the information from our Client about antibody that you sent as a replacement are still bad . Anti-KAP1 antibody CHIP grade (ab10483). Enclosed is file, which our Client attached to her mail. Could you offer a solution to the Client? I am sorry to hear that the customer is still not happy with the results obtained with ab22553. Having looked at the information provided by the customer it seems that the new lot has reduced the level of non-specific band observed at 40 kDa. In order to investigate this case further, would you be able to ask the customer for a few further details? Could they please fill in the form I have attached to this email, detailing the protocol used with the antibody. Could they also share an image of the blot of when the antibody worked at a dilution of 1/1000 with only 6 ug of protein? Which type of samples were used? I will contact the lab to see if they have observed any differences in the intensity of the signal of the antibody.